I haven’t blogged for days. I’ve been lazy. And busy in other ways. I did a bit of gardening work. And I mean a BIT. While mowing I killed Santa. 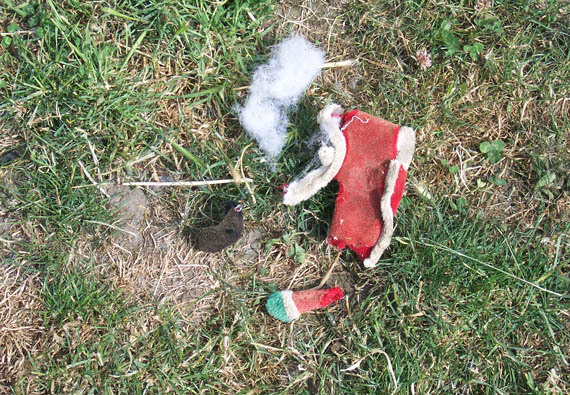 He was a toy the dogs have had for a few years now, he was lying on the grass… I did try to mow past him but he got sucked into the mower blades and was dismembered. There were Santa guts everywhere. The dogs are in mourning. I’ve also had a lot to think about… about myself, new year’s resolutions, where I am in my life and what I want from my life. I’ll have some more to say on that later at some stage. I’ve been doing a lot of thinking. For now I just wanted to touch base and let everyone know we’re ok. There are fires burning around Tasmania with the strong winds and extreme heat, but we are safe. But then again, its too hot to do anything and at least the amount of energy expended typing is less than that expended doing anything else. I’m sitting here on a recliner, two fans and an evaporative cooler working overtime to keep the living room bareable. Occasionally dripping water I’ve poured over my head. Dogs flat out, panting around me. The phone is next to me. As are the tv controls. Getting off the chair uses produces too much energy and thus heat. The less I move the better. Dinner for tonight will be fruit, cheese, dips and crackers. No cooking.